Life at Milfiori is restful and unhurried. The house is spacious and artfully decorated with many period pieces. It is like stepping back in time from the moment you cross the threshold. Each bedroom is completely unique and melds beautifully with the period of the home. One bedroom has a vintage claw foot tub en-suite. All the bedrooms are filled with light and look out on the garden. Local artists are featured throughout the house, many of the paintings were painted "plein air" at Milfiori. There is a charming caretaker's cottage on the property and a beautiful old barn. Adjacent to the main house is a stone building with heavy metal doors. In decades past this building served as the bank as well as the village store. You can still see the well that served the community of Douglas Flat. 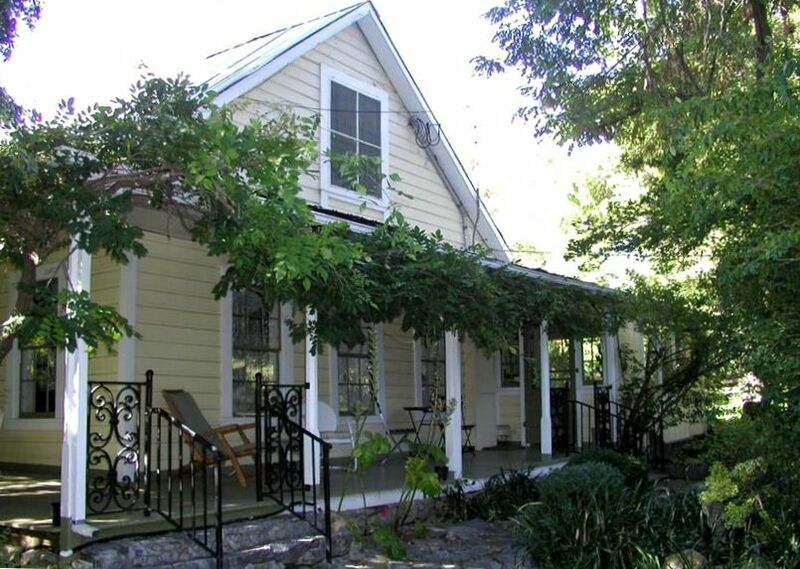 The house is in the heart of Calaveras County's wine growing region. Stop in at any of the wineries to meet the owners and learn about the local wines. You will be pleasantly surprised. For a more active day, explore the old mining towns and visit one of the numerous museums for the local lore. Go antiquing or spend the day hiking in nearby Big Trees State Park or skiing at Bear Valley. Or just enjoy the grounds at Milfiori. Sit on the porch and read a book or stroll through the gardens and try to identify the variety of flowers and plants (the name means a thousand flowers). Take the time to enjoy the slower pace of life in the Gold Country away from the crowds. Please, no entertaining. Due to the age of the house and extra wear and tear, we cannot accommodate guests other than those already staying at the house. Special events in the garden are possible with prior arrangement. Check with the owner for rates and availability. The owner is on the premises, available to answer your questions or give suggestions on how to make the most of your trip to the Mother Lode. I retired to the Mother Lode from an active and stressful career in the Bay Area. I fell in love with Murphys and knew I had found something special when I first saw Milfiori. I love the historical buildings on the property and the beautiful garden. It is magical. I do antique and vintage sales out of the old "Italian Store" twice a year. You might be able to do some shopping right on the property. And I love to give a tour of the property. Milfiori is a beautifully restored farmhouse built in 1861. It is surrounded by serene Provence-like gardens and wonderful porches covered with trailing vines. I stayed here recently with four other ladies, and we greatly enjoyed our stay. The house and grounds are beautiful. It was quite cold or we would have spent some time outside, since the patio is lovely and there's plenty of outdoor seating to enjoy. The kitchen is fairly modern and the house is well heated so we were comfortable despite the cold. The house was clean and we were provided plenty of linens, blankets and towels. Beds were comfortable, and we all enjoyed having our own bathrooms attached to our bedrooms. The nearby town (1.5m) is close enough to provide any immediate grocery needs, and there's lots of wine tasting right up the highway. We were only there for a short weekend but we greatly enjoyed our stay, and Willi was a wonderful host. She walked us through the house, explained the basics and then left us to our own devices. We'd definitely stay again. The house is definitely special and history behind is amazing. Unfortunately for us it rain while we were there so we didn’t get the opportunity to enjoy the grounds. Willie is a very sweet lady and was happy to help with everything, which was really nice. Note, this is not the house for you if you like your privacy. Willie lives on the property, right across the driveway from the house and there are no blinds/curtains so your privacy is limited. This didn’t really bother us but I know some people would be uncomfortable with that. I believe everyone who comes to this area should send some time Milfiori. You won’t be disappointed, so much character and charm. This property is amazing! Furnished with Antique treasures, Vintage finds and lots of Love. Three couples that wanted to get away for the weekend with no interruptions to plan a 2019 holiday were thrilled with their stay. Cooked in, had coffee on the front porch in the morning and made good use of all the rooms. Willi, our host, was a joy while she shared some of the propery’ History and gave us our tour of the house and “Italian stone store”. Everything you need in a fully furnished home. Thank you, thank you! We can’t wait to return in the spring while the garden is in bloom! One of the most beautiful houses and locations keep us coming back. As always Milfori was well appointed for all of our needs. We come with a group of friends so the large kitchen and dining room give us plenty of communal space to hang out and catch up. The location is great for enjoying Murphys Wine Country without having to be in the hustle and bustle of downtown. it was a very hot weekend but the house was cool and the rooms were comfortable. We had a great time! What a great property, we had a wonderful weekend. House is well stock with everything you need. We all enjoy walking around the house and property discovery antiques and fun treasures. Willi was a great host and gave us a tour of the house when we arrived. I think morning coffee talks on the porch were our favorite time, while we over looking the beautiful garden. We will definitely be back.